Our work at It's Our Mission: Period! can't be done alone . . .
to join together to accomplish it. work ethic and their heart to serve God through the work of their hands. danMark Graphics is a local, family owned and operated business, located in Casnovia, Michigan. Our mission…to serve Jesus Christ through printing and design. We’ve been providing quality screen printing, vinyl signs, vinyl decals, banners, and graphic design services since 2004. With a combined 50 years of experience, we offer exceptional service with superior quality and value. Visit our website at www.danMarkGraphics.com or our Facebook page “danMark Graphics LLC” to learn more. 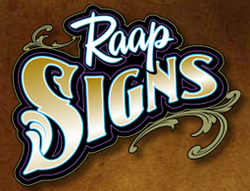 Raap Signs is a family owned business. We have been servicing western Michigan since 2000. We are a custom sign shop that will service you from concept to completion. All of our design work is done in house, including our own website. We pride ourselves on our service, quality and craftsmanship that goes into every sign. We want your sign to make a lasting impression. We invite you to stop in and browse our showroom, we have samples of our products, along with personalized gifts, awards, and more. You can also find us on Facebook and Linked In. Diaper Sewing Supplies offers the supplies you need to make cloth diapers and other washable, reusable household items. Diaper Sewing Supplies is a family-run business since 2006, located in Saint Louis, Missouri. Our mission is to help you save money, limit the waste put in landfills, and be fashionable and comfortable. We believe high quality, reusable items that work well and look adorable motivate families to use cloth - and that can literally change the world.